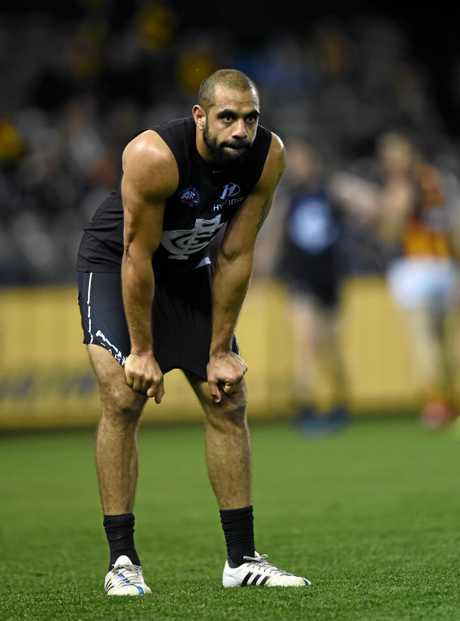 ESSENDON legend Tim Watson says AFL clubs may consider handing Chris Yarran an AFL lifeline if he can prove he's over his drug addiction and committed to footy. A video of Yarran revealing an ice addiction that derailed his career surfaced on Thursday, months after it was originally posted on YouTube. At only 26, Watson suggested the former Carlton and Richmond player had plenty to offer and that an AFL club may be tempted to rookie list Yarran as a result. "Yarran could still build a football career if that's a world he wants to re-enter," Watson said on SEN Breakfast. "He was a prodigious talent, (although) the margin for error for him now is pretty slim. "I'm prepared to say though, his name will come up in discussions at clubs today." West Coast superstar Ben Cousins was offered an AFL lifeline by Richmond after he was released from the Eagles in 2007. Nathan Krakouer was rookie listed by Port Adelaide in 2015, after his life similarly spiralled out of control. Watson suggested such precedents would have a number of AFL clubs wondering whether it would be worth taking a punt on Yarran. "Maybe he has now reached a point in his life that he understands and wants to grab hold of the opportunity to better his life," Watson said. "He's a young man. The possibilities are endless. "There is no reason outside him not wanting to that he couldn't be playing AFL footy in 2018. He may have to do it via the rookie list but there is no reason he can't be doing that." Yarran played 119 games and kicked 90 goals for Carlton from 2009-15. He was traded to Richmond at the end of 2015, but never played a game for the club because of injury and mental health issues. Yarran revealed in a testimony with the Potter's House Christian Fellowship Church that he'd been introduced to ice by a family member. While it's unclear whether the forward took the drug while at Carlton, the testimony matches up with Yarran's time at Richmond. "Drugs were something I had despised my whole life and I remember, as I was about to try ice, I said to myself 'this will either be a good night or it would ruin me'. It ruined me," Yarran said. "It destroyed my relationship, my career, my finances and my health - physically and mentally. "Physically, I went from a fit, healthy athlete to a slob. I stacked on the weight and that's when I started to miss training, because I didn't want to be seen in the messed-up state I was in."